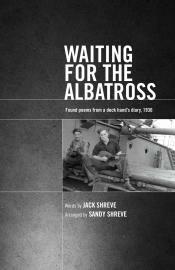 In Waiting for the Albatross, Sandy Shreve has composed found poems using fragments from a diary her father, Jack Shreve, wrote in 1936 when, at age 21, he embarked overseas as a deck hand on a freighter. The five-month voyage took him from Halifax, through the Panama Canal and across the Pacific to New Zealand and Australia; then back again, docking at Montreal. Facing the uncertainties and upheavals of the Great Depression, Jack learned to survive in a world that was both hostile and exhilarating. Nearly eighty years later, his daughter turns his experiences into a poetic tribute that remembers the amazing resilience of a generation. Shreve’s vivid poems are illustrated with photos from her father’s journey.